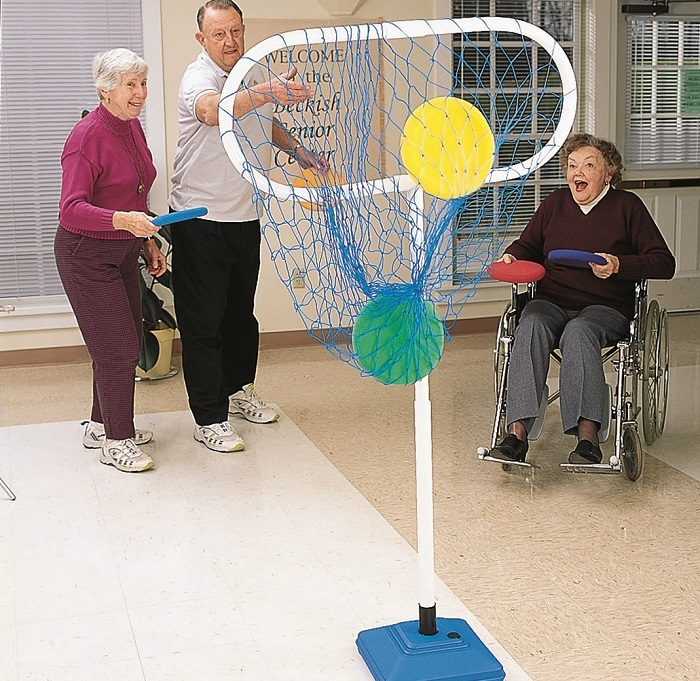 Provide a variety of toss and target activities for residents to play that will improve their hand-eye coordination. 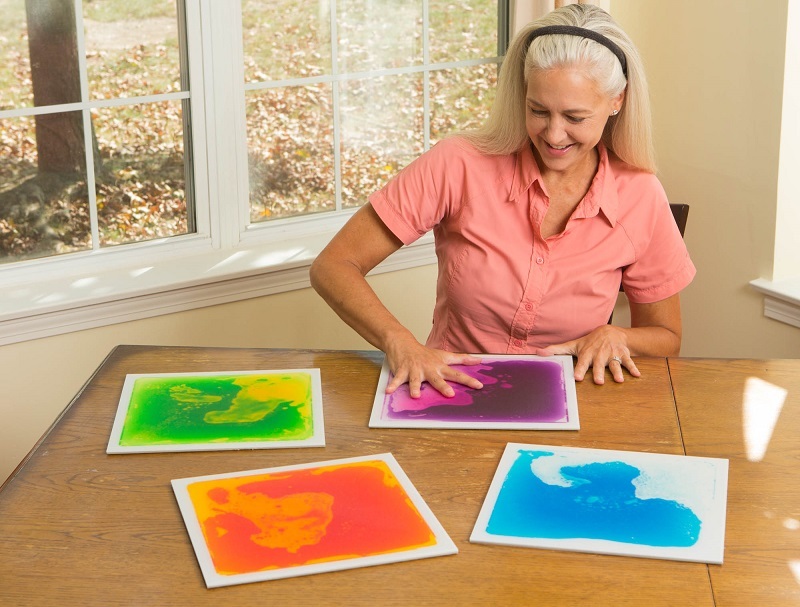 Consider scheduling a few traditional tossing games that residents are familiar with, a couple new tossing games that you can alter, as well as several jumbo tossing games that make it easier for all your residents to participate! 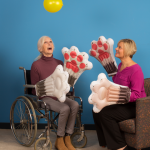 Inflate several fun jumbo-size games that your residents will enjoy. 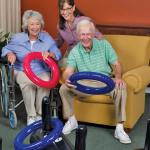 Set up a jumbo ring toss and encourage your residents to toss the inflatable rings over the extra-large ring toss peg. Because the game is quite large and easy for your residents to see, you can seat all your residents around the perimeter of the game and have them play from their seats. 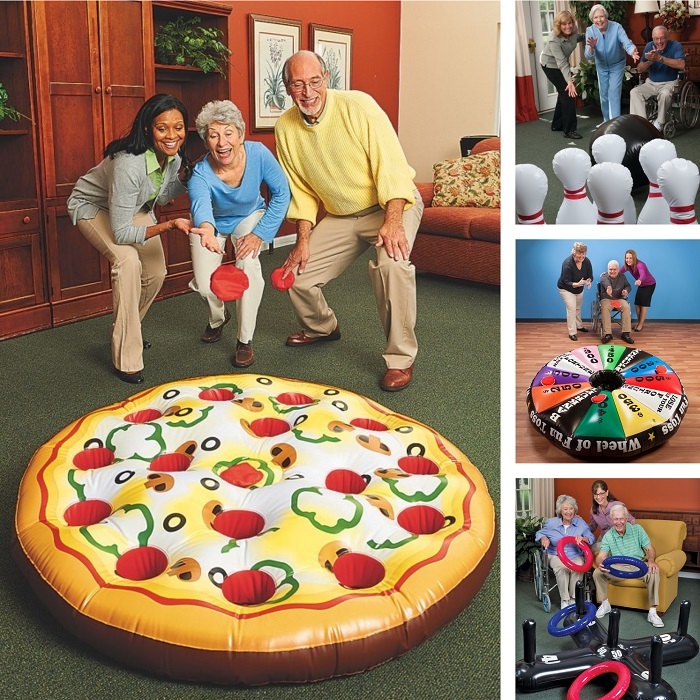 Other fun jumbo-size games to play include the inflatable pizza toss game where residents toss beanbags into the pepperoni holes, and the inflatable bowling game, which is great even for your wheelchair-bound residents because they can easily roll the bowling ball without their chairs getting in the way. 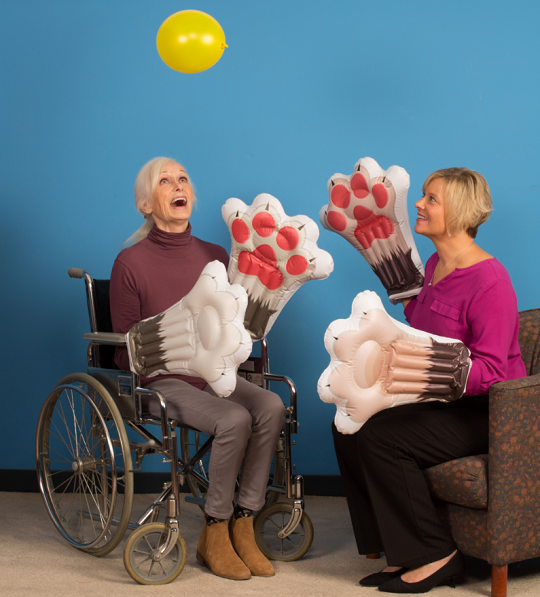 Invite your residents to play a fun version of the popular game Wheel of Fortune by using this inflatable toss version where residents toss beanbags to accumulate money. You can even pass out Monopoly money and have residents count their money at the end of the game to see who won the most. 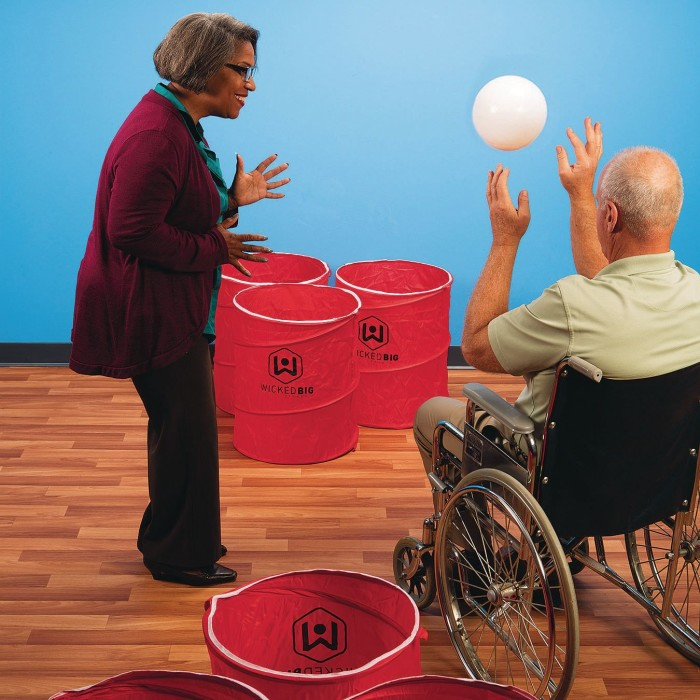 Invite residents to play fun traditional games, like floor basketball and disc toss, where they toss the ball or disc into a target. 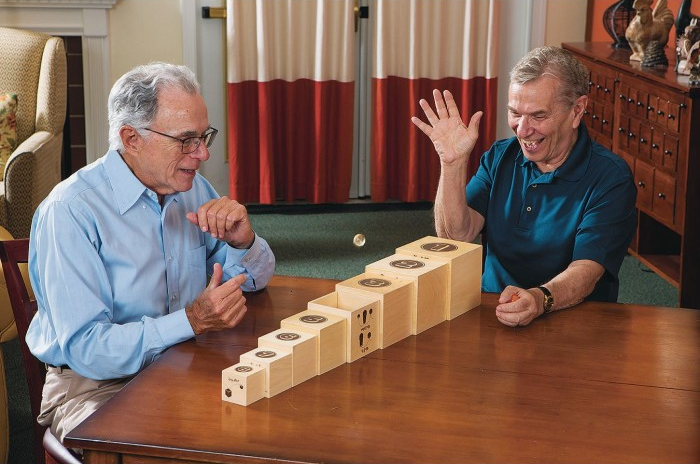 Since most seniors are aware of how to play those games, consider making the games more interesting by grouping residents together to form teams. Have the teams compete against one another to see who can score the most baskets or toss the most discs in the hoop. For baseball lovers, try this bounce baseball set! 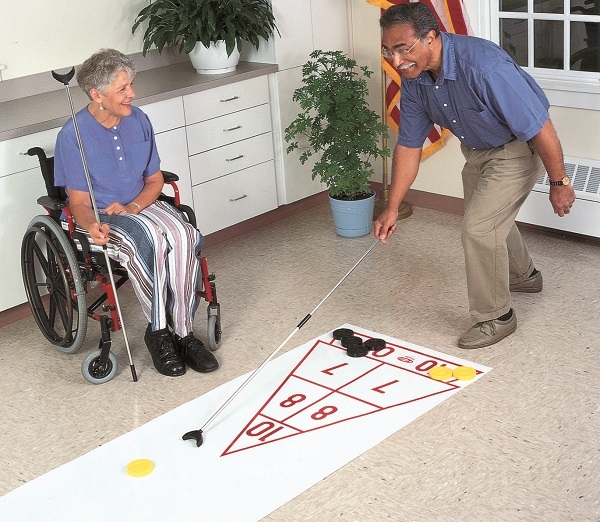 Organize a few new tossing games for your residents, where you can alter the games a bit to meet your residents’ needs. 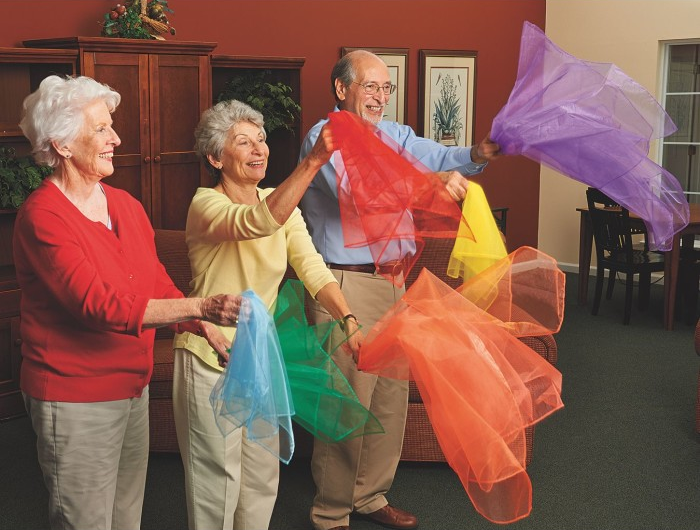 Use a therapy ball to play a fun bounce toss, where seated residents bounce-pass a confetti rain ball to one another. 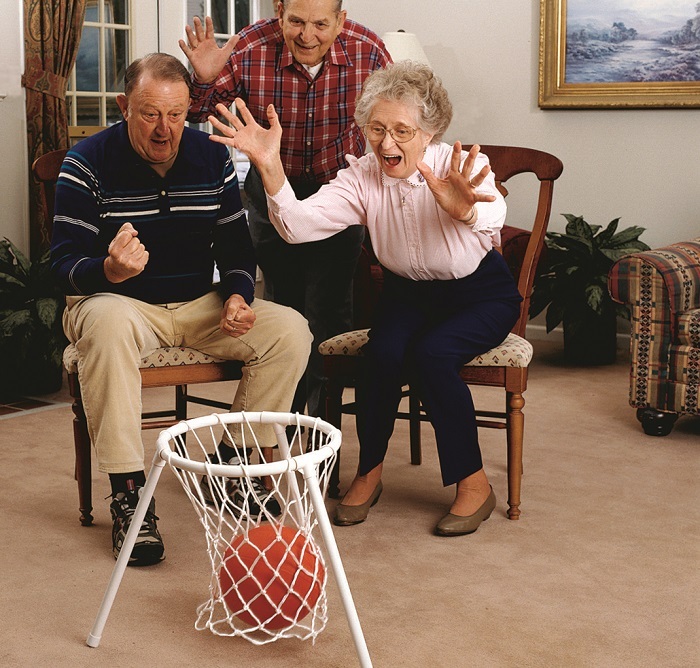 For your more slow-moving residents, seat them at a large table and have them roll a slow-moving ball back and forth on the table. 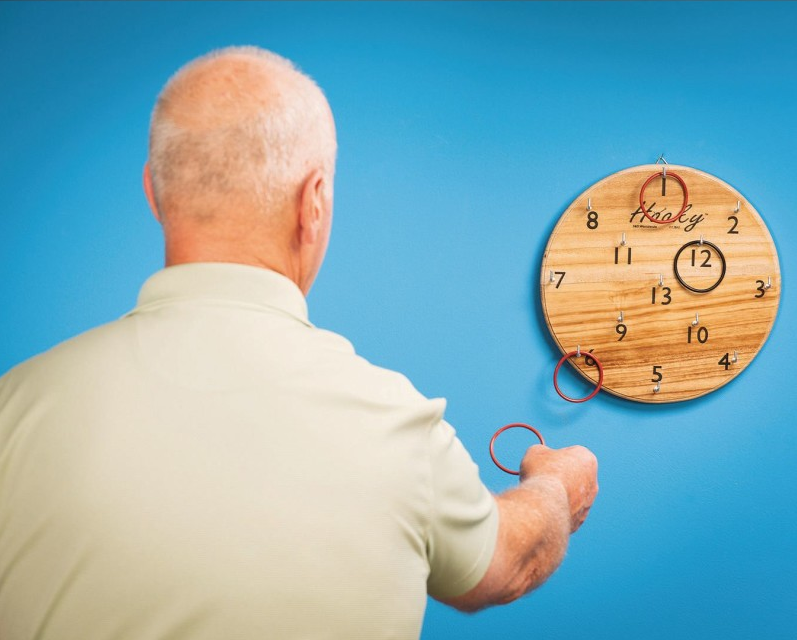 If you’re looking for a new tossing game altogether, then encourage your residents to play a fun game of hooky toss, a fun pub-style game where residents toss rings to land on hooks. The first player to score 101 points wins! It also comes with instructions on how to play a variety of games. View all tossing games here. 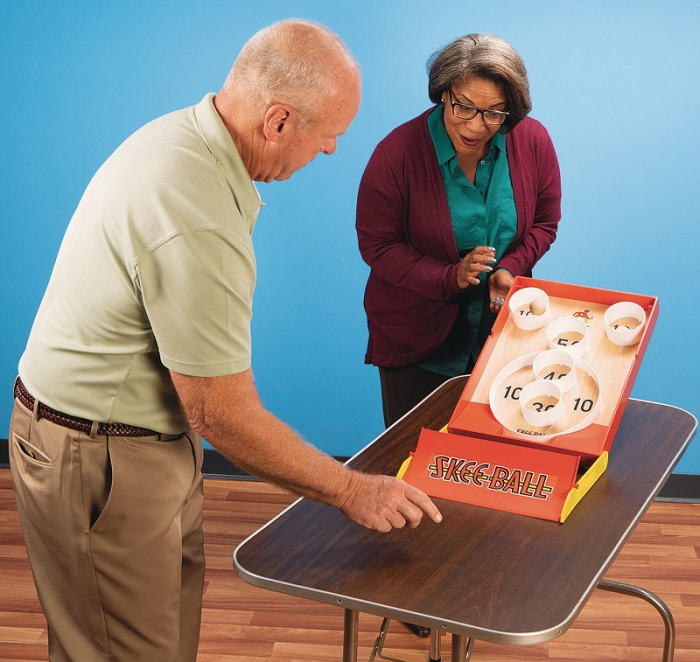 Make playing games that much easier by providing tabletop games for your residents to enjoy. Host an Olympic Trials activity in your facility, and set up a curling game to teach your residents all about the sport of curling and how to play. Be sure to educate your residents about popular curling terminology like the house (the target on the board) and the button (the center circle of the target). Another tabletop game that is sure to please is the Skee-ball game. Add in this fun game for your upcoming carnival themed activities or even as a fun intergenerational activity where residents and their grandchildren can play with one another. With this popular arcade game, residents can play solo or in teams. Check out the variations to the classic game that allow your group to match their skills level or challenge themselves! 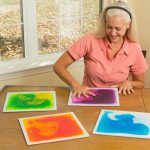 A final tabletop game to consider adding to your monthly senior activity calendar is the new stacking and nesting game. Bounce the 8 balls into different configurations of the wooden nesting boxes. This helps game challenges and strengthens hand-eye-bouncy-ball coordination and fine motor skills. It can be played alone, in pairs, or even in groups. View all tabletop games here. With the weather warming up, consider planning several activities outdoors so that your residents can enjoy the fresh air. Use several game sets that can also be played indoors when the weather doesn’t want to cooperate. 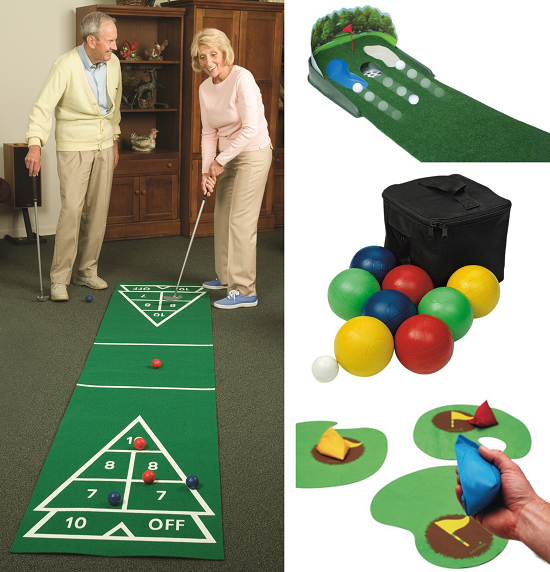 Host several golfing and shuffleboard games for your residents where they can show-off their putting skills, like in a shuffle putt game or a putting green game.They can also show-off their tossing skills with a golf target toss game or this new battlechip toss golf game, and improve their aiming skills with a game like shuffleboard. 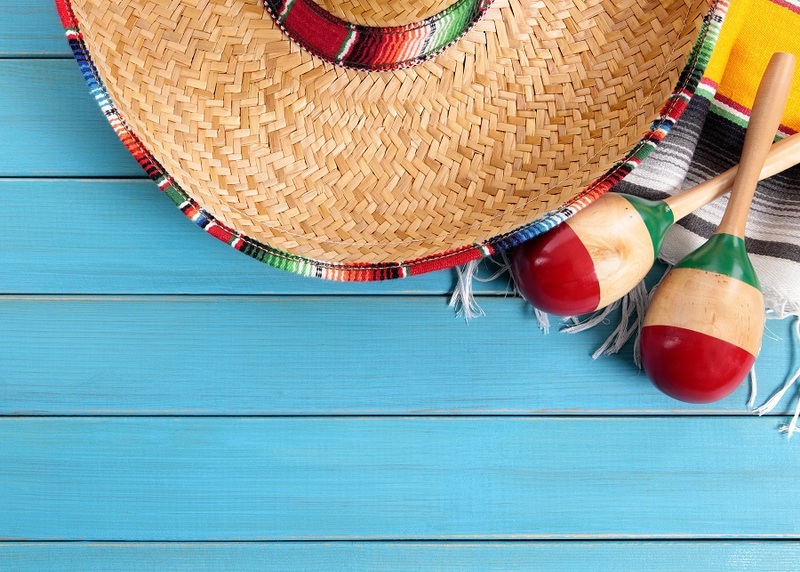 Invite residents to play the Italian game of bocce ball, where seated residents roll colorful balls to land closest to the jack ball (the white ball), and the fun game of tennis, where standing or seated residents hit balls over the net using plastic rackets. Both of these fun games can be played in the backyard on the lawn, or in your Activity Room. 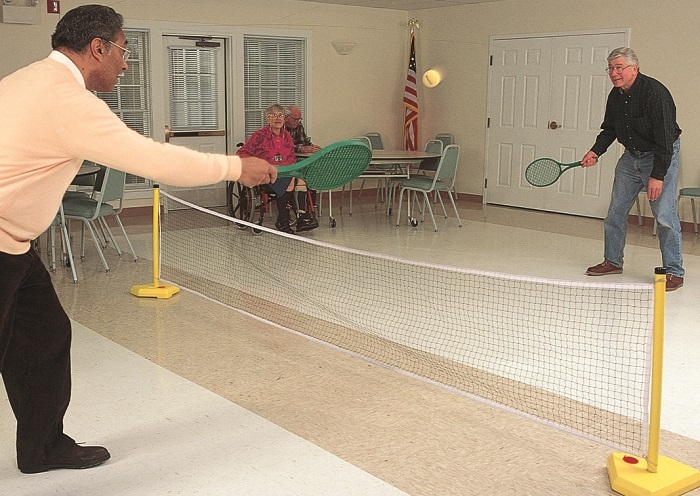 Show residents how much fun they can have playing pong without the beer! Simply set up this jumbo pop-up pong game using the large pop-up cups and weighted bags, and divide residents into teams to compete against each other to see which team can toss the most bags (or balls) into the cups. View all of our Movement Therapy items here. This entry was posted in Senior Activities and tagged active games, activity director, assisted living, indoor activities, indoor games, inflatable games, jumbo games, memory care, Movement therapy, notjustbingo, outdoor activities, outdoor games, retirement home, senior activities, senior center, senior facility, senior games, senior residents, seniors, tabletop activities, Tabletop games, target games, toss activities, tossing games by S&S Worldwide. Bookmark the permalink.